JAMESTOWN — Daniel and David Barron of Jamestown have been experiencing fair week together for four years. The Barron twins became involved in 4-H because their father, Paul Barron has always been a part of agriculture. Paul represents Ross Township on the Greene County Fair Board of Directors and Officers. 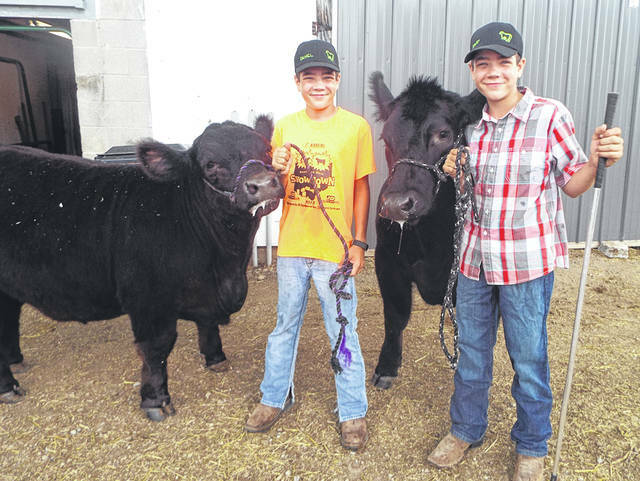 The twins explained they have always lived on a farm, so it made sense to become involved in 4-H. They never thought of doing anything else. Both agree that living on a farm isn’t easy. The twins are committed to working long hours to keep their animals in the best shape. Their day begins by waking up at 6:30 a.m. to check on the calves. They feed, bathe, and work with their calves throughout the day and night. Sometimes they are out in the barn until 10 p.m. or later. The brothers are entering the seventh grade and with the help of their parents, their animals are well cared for. During the school year, their mom, Ruth Barron helps in the morning and the boys wash the calves at night. Leading up to fair week, the twins constantly work with their calves. Making sure they are cleaned with long hair, and are willing to cooperate when setting up for the judge. The appearance affects the quality of their animal. Currently, they have two steers, five heifers including feeder calves, four lambs and several other herd cows in the pasture. The twins aren’t the only ones who show in their family. Their little sister, Gracie has shown in open classes for three years. Last year her highest placing was third and she won a trophy. She has shown pigs, cows and goats. This year she wants to win more trophies and next-year plans to show a feeder calf and lamb. The brothers have a goal of winning Grand Champion this year and believe they have a good chance because the calves are filled out with a good bone structure and lots of hair. A challenge this year has been getting them to eat in the heat. Most animals don’t like eating when it is hot, said the twins. Fair season is not the only time they show. Daniel explained, they both go to the Best Circuit Shows. They are “little working vacations,” said Daniel. The circuit shows have people from all over the world attend. There is a show in Lima with 1,000 head of cattle. Most are 700-800 head. These shows are hard to place in because the number of cattle, but good practice. This year the brothers went to the Clinton County Fair where they showed their lambs in an open class. This gave them the opportunity to show for the first time before they competed in their county. Open shows allow participants to show at multiple fairs. In open classes, you are able to see how your animal competes with other counties. The twins will show in a total of seven shows at the Greene County Fair this year. Last year Daniel placed second, third and fourth in various shows. David placed first and third in several classes and had the Grand Champion Feeder Calf. Winning is always fun at the fair, but the worst part is selling their steers. The first year they showed, the brothers sold all of their animals and had nothing to do once they got home. Ever since then, they always bring back their heifers and calves. Once the Greene County Fair is over, the Barron family will continue their regular schedule of caring for their calves. The cycle repeats again next year.